Amazon has officially become the world’s second trillion dollar publicly traded U.S. company, in terms of market cap, which is simply the company’s number of outstanding shares multiplied by its stock price. Amazon shares briefly crossed the $2,050.27 mark in intraday trading today, giving the online retail giant a market cap of slightly over $1,000,000,000,000, based on its latest total of 487,741,189 outstanding shares. The milestone was fueled by a roughly one percent increase in Amazon’s stock price today. 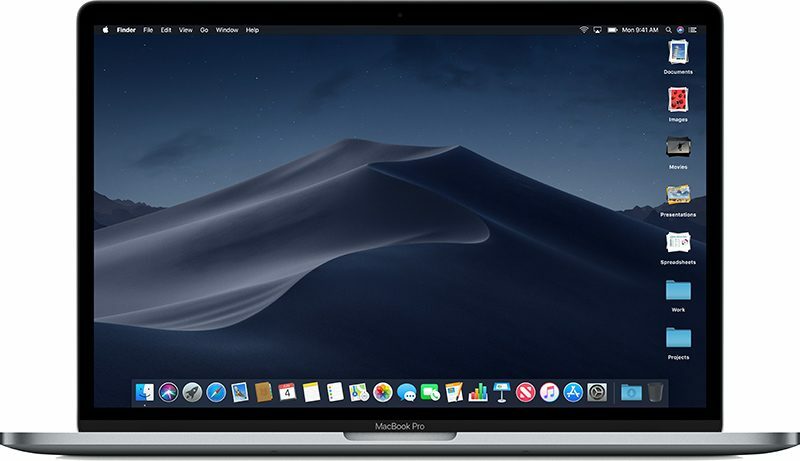 Apple today seeded the tenth beta of an upcoming macOS Mojave update to developers for testing purposes, one week after releasing the ninth beta and more than two months after introducing the software at the Worldwide Developers Conference. Last year’s specs are now considered mid-range, and that’s a pretty good deal for most consumers. Android One means the G7 One will get at least two years of regular updates, and we already know Android 9.0 Pie is coming to “qualifying” Android One devices by the end of the fall. 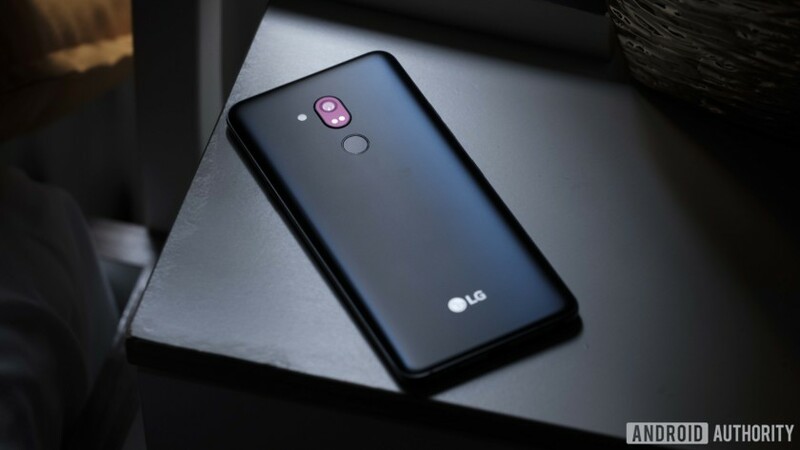 Our LG contact confirmed that the G7 One will get the update then, which is a nice treat for anyone looking to get in on Google’s latest and greatest. The Sony Xperia XZ3 has been revealed, and it has Sony’s first ever smartphone OLED display. But while it’s the newest Xperia, it’s not the only one around. Should you be saving your pennies for Sony’s latest, or should you invest in other Sony flagship phones that were released within the past four months? Those include the Xperia XZ2 Premium, Xperia XZ2, and XZ2 Compact. To find out, we put together a jumbo-sized battle royale, with your pocket space as the prize. Since all four are equipped with the powerful Snapdragon 845, you’re likely to find similar performance in each. The amount of RAM available in each phone varies, but since all have at least 4GB available, you’re unlikely to find much of a difference in real-world performance. 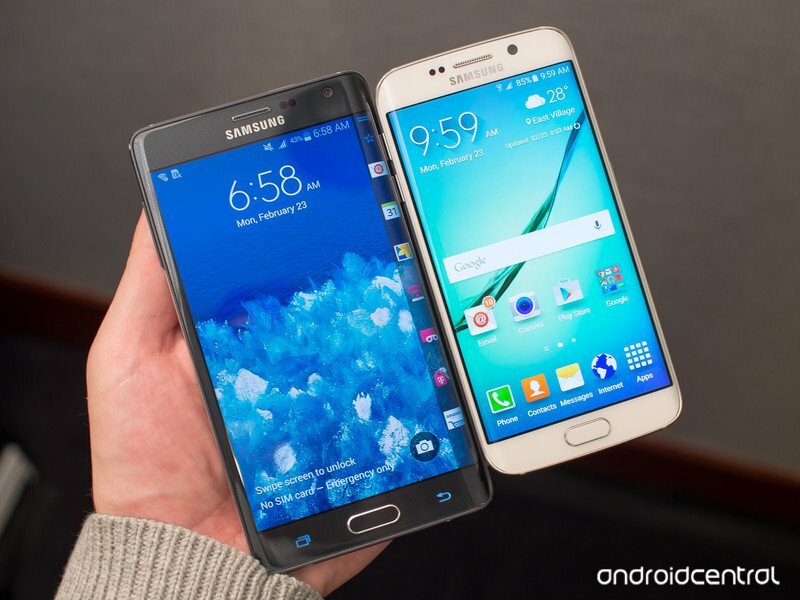 They are all square on storage space too, with 64GB available in each and up to 512GB extra through a MicroSD card. Can the battery break the tie? Possibly. Each phone has a battery sufficient for at least a day’s worth of tapping, streaming, and watching. The XZ3 has a slightly larger battery than its counterpart, which puts the XZ2 out of the running — but the XZ2 Premium and XZ2 Compact both sport great batteries for their sizes, even with the Premium’s massive 4K resolution pulling hard on the 3,540mAh battery. There’s Quick Charge 3.0 on each of these phones, too, but the XZ2 Compact suffers slightly in lacking the convenience of wireless charging. With the Compact out of the running, it comes down to the XZ3 and the XZ2 Premium — and having 2GB more RAM just squeezes the win for the XZ2 Premium. Realistically, the XZ3 and XZ2 Premium are neck-and-neck. All four of these phones follow Sony’s new Ambient Flow design ethos, but there are small differences to be found. First off, the XZ2 Premium’s 16:9 aspect ratio display gives it some seriously chunky bezels at the top and the bottom of the device, putting it out of the running. The XZ2 and XZ2 Compact have a slimmer forehead and chin, but neither can compete with the more curved look Sony’s taken with the XZ3. The XZ3’s screen curves into the body, reducing the bezels on the sides, and it’s combined with further reductions of top and bottom bezels. Other than these differences, all four phones are pretty much the same. They all are IP68/65 rating for water and dust-resistance, none has a headphone jack, and they’re all on the heavier side for 2018 smartphones. All but the Compact are also extremely slippery glass phones, so it’s definitely worth picking up a case for grip and protection. The Compact has a glass back and it’s easier to hold, which makes it slightly more durable. Still, the design changes made with the Xperia XZ3 make it the more attractive phone. The Xperia XZ3 is the first Sony smartphone to come with an OLED display, putting the IPS LCD displays in the XZ2 and XZ2 Compact to shame with deep inky blacks and bright vibrant colors. But can it beat the astoundingly sharp 4K resolution of the XZ2 Premium? It’s a hard choice to make, and one that’s likely to be personal — but for us, it’s so hard to tell the difference between the sharpness on the XZ3’s Quad HD+ resolution and the XZ2 Premium’s 4K resolution that the better OLED color reproduction and deep blacks on the XZ3 make the choice clear. The XZ3 might have the best screen we’ve ever seen on an Xperia phone, and it wins this round. Sony’s camera hardware is some of the best around, but it tends to fall slightly short of true greatness. The XZ2 and XZ2 Compact have capable cameras, but it’s the dual-lens XZ2 Premium that showed us what Sony’s really capable of with some exceptional low-light performance. The XZ3 should be the next step up in Sony’s evolution, but for some reason the company chose to step back down to the same 19-megapixel single lens from the XZ2. We’re expecting the XZ3 to have a strong camera — but we doubt it will be capable of matching the XZ2 Premium’s performance. Around the front of the XZ3 you’ll find a 13-megapixel selfie shooter that’s much the same as the XZ2 Premium’s. All four of the phones also support 4K HDR video recording and super-slow motion video at 1080p. Each of these phones have a capable camera suite, but we’re confident that the XZ2 Premium is the strongest of these four. Sony’s record with Android updates is strong, but the XZ3 takes an immediate lead straight out of the gate with the inclusion of Android 9.0 Pie. Sony has confirmed that the entire XZ2 range will receive Android 9.0 Pie eventually, but since that’s yet to happen it gives the XZ3 the lead. Being a newer phone, you can also expect the XZ3 to be supported for slightly longer than the XZ2 range. Outside of the more advanced operating system, you’ll find similar amounts of Sony’s usual bloatware applied to these devices. The Xpera XZ3’s use of Android 9.0 Pie gives it the win here. 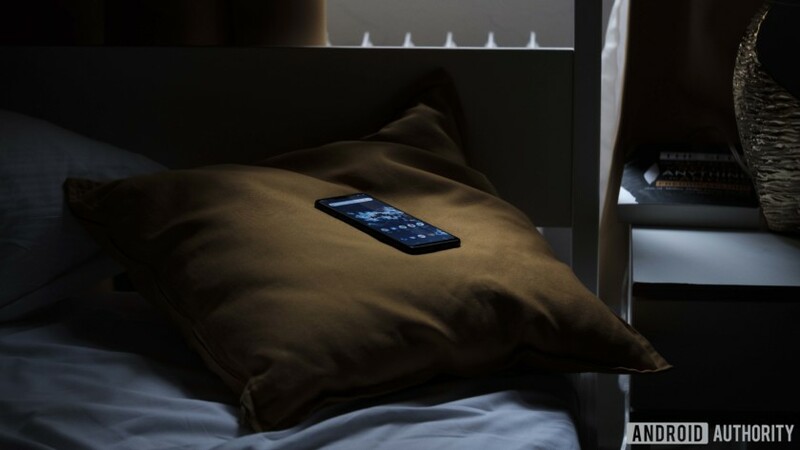 Being a Sony-made device, every one of these four devices comes with Sony’s PS Remote Play that allows users to stream their PlayStation 4 gameplay to their Xperia smartphones, bypassing the need for a TV. Another niche feature is the 3D Creator app, which creates 3D models of objects using the phone’s camera. 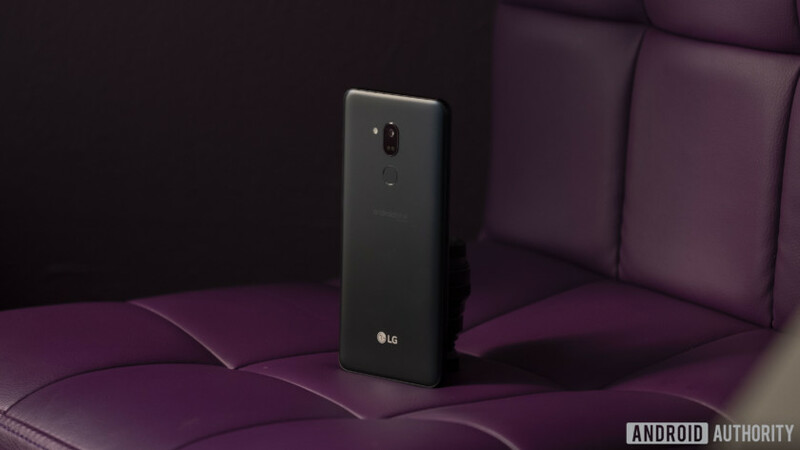 You’ll also get a more immersive experience from the Dynamic Vibration System on the XZ3, XZ2, and XZ2 Premium that vibrates during videos to emphasize punches, gunshots, or other activities. Sony’s added more features to the XZ3 though, and you might find them more useful. Side Sense is similar to Samsung’s Edge Sense, and it brings up a shortcut menu of frequent apps and actions when you tap the side of the screen. The Smart Launch feature launches the camera automatically when held in landscape. The Xperia XZ3’s additional features are still a little niche — but since it gets everything the XZ2 range gets, this is clear win for the XZ3. You can buy one of Sony’s Xperia XZ2 smartphones from a range of retailers right now, but you’ll commonly find them on Amazon and Best Buy. The XZ3 will be available from Best Buy and Amazon from October 17. The Xperia XZ3 will set you back $900, while the XZ2 Premium retails for a staggering $1,000. The XZ2 costs $800 — and the XZ2 Compact is the cheapest of the lot, starting from $650. Xperia smartphones don’t work with CDMA networks, so there’s no support for Verizon and Sprint — but they will work fine with AT&T and T-Mobile. The Xperia XZ3 is, in many ways, a very similar beast to the XZ2 range. There’s been no really big jump in power or design, and most of the improvements involve fine-tuning rather than an overhaul. But the differences that are present are enough to make the Xperia XZ3 the more solid choice out of the four on offer. The exception is the XZ2 Compact, which targets people who desire smaller phones. It’s one of your best choices if you don’t want a massive device. 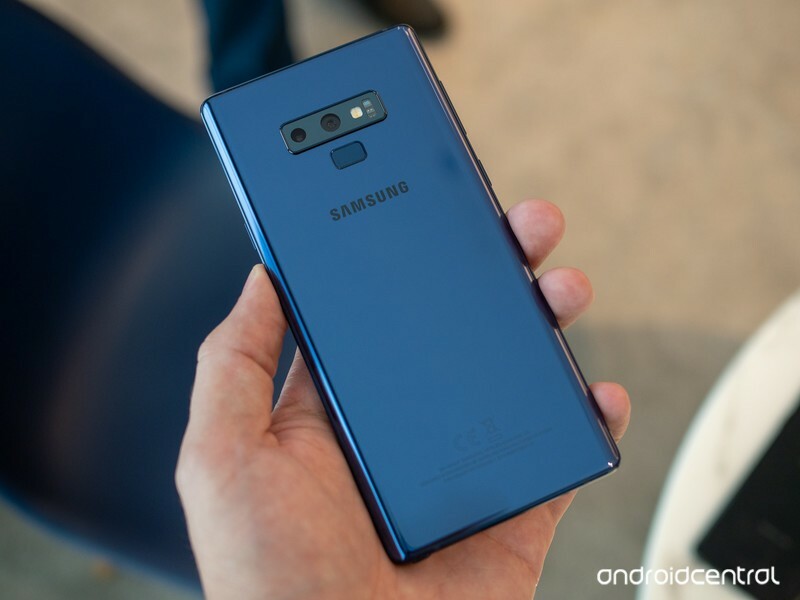 Late last month, Samsung officially launched the Galaxy Note 9 for everyone around the world to purchase. The phone’s not cheaper with a starting price tag of $1,000, but you definitely get what you pay for thanks to the gorgeous display, huge battery, S Pen, and more. None at all. This is the phone I’ve been waiting for. Don’t get me wrong I loved the Note 8 but this thing is great. No regrets here. I got both note8 and note9. I can go back and forth when want to. But since getting the note9, the note8 has been put in it’s original box for back up. I’m happy with my N8->N9 upgrade. I like the stereo speakers, the much longer battery life, the enhanced S-Pen, the dual-aperture camera, and the extra storage (128 GB is sufficient for me, in addition to my 256 GB SD card). And the AR emoji are cute. Plus I got the free Duo fast-charging stand, Dex station, and AKG Bluetooth headphones. And I sold my N8 for more than $400. Accurate typing on the go! Amazon currently has the unlocked BlackBerry KEYone on sale for just $349.99, which is a new all-time low. When it was first released, the KEYone sold for $550 and recently it dropped down to a regular price of $400, making today’s price an extra $50 off. 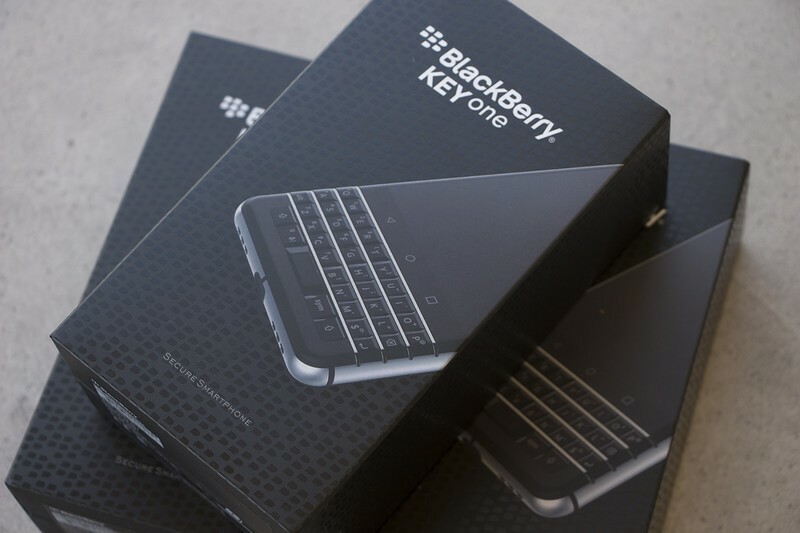 CrackBerry has the rundown on everything you need to know to use your new KEYone, including a Beginner’s Guide and a list of helpful how-to articles. The BlackBerry KEY2 is also now available for pre-order, though it is priced at $650. The mobile industry has been tracking this rumored Samsung “Galaxy X” prototype phone for several months, gradually pushing back the supposed launch timeline for what’s apparently to be a successor to the general “Galaxy S” line. But even so, we’re still struggling for details on what this supposed Galaxy X with a foldable display will be. Here’s the latest information. No, you didn’t miss an announcement — Samsung didn’t have anything public to say about the Galaxy X (if that is its real name) at CES 2018. But as many companies do, Samsung took the opportunity of having so many high-up industry people together to show off what it’s working on to partners. According to The Investor, this year that included the Galaxy X. The device in question has a 7.3-inch display that can fold in the middle — multiple versions were shown, with different capabilities such as folding both inwards and outwards. The inward-folding model (protecting the screen when closed) is reportedly the design with the most traction at the moment. The outward-folding one, on the other hand, includes “more advanced next-generation technology,” whatever that entails. The rest of the specs of the phone aren’t yet known, and considering how far out we are from a potential release — reportedly as late as early 2019 — those can and will change between now and then. How will a ‘foldable’ phone actually work? Samsung has of course been putting curved panels in production phones since the Galaxy Note Edge that eventually spawned into a phenomenon that has become a hallmark of Samsung’s high-end devices. The company has been experimenting with bendable OLED panels for years, going so far as to show them off publicly as technology demonstrations. 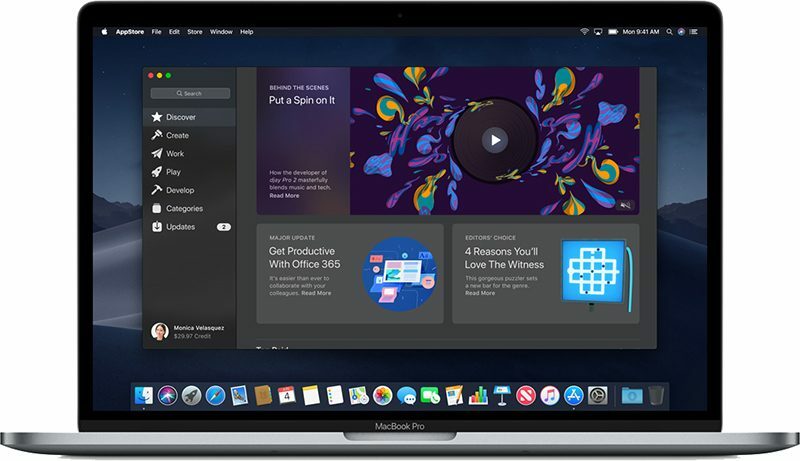 But the question is whether it could make devices with displays that could be actively bent or folded thousands of times as a regular part of use. The display would have to be very robust, but then you also have the issue of what covers the display panel — typical Gorilla Glass wouldn’t do the trick. LetsGoDigital has worked up renderings based on reports and patent filings that show the Galaxy X as a vertical-orientation phone, but with a hinge mechanism built into the sides of the phone. 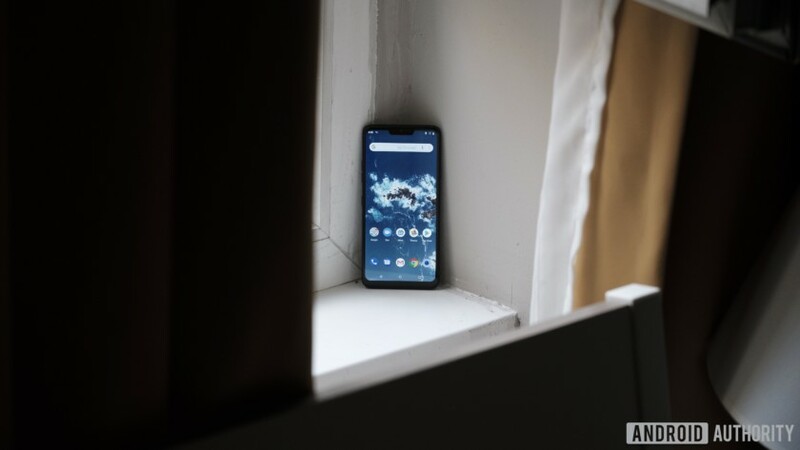 The phone would be rigid (and what looks to be extremely tall as well) when the display is extended and flat, but you could pull the top and bottom apart to expose the hinge to then bend while the screen follows suit. Further renders show the phone while closed, which leaves a gap around the hinge portion not unlike a Microsoft Surface Book laptop. 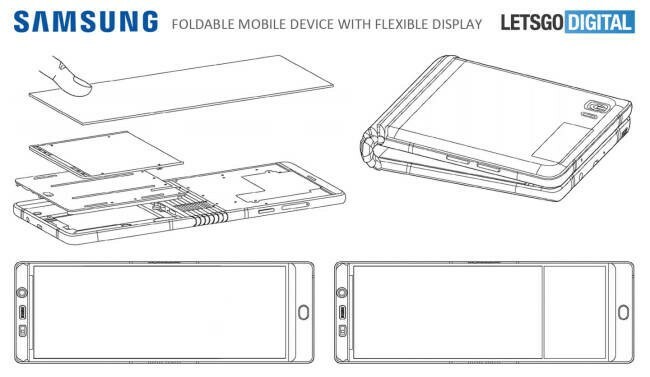 Large internal components would of course split between the top and bottom halves of the phone by the hinge. Early rumors pointed to a Galaxy X with a hinge and two displays, but now we’re talking about just one panel. Early rumors of the Galaxy X pointed to some sort of announcement or teaser as early as late 2017, which obviously didn’t happen. But those same rumors questioned whether the Galaxy X was truly a “bendable” phone with a single screen, or simply a hinged device with two distinct panels — like the ZTE Axon M, for example. 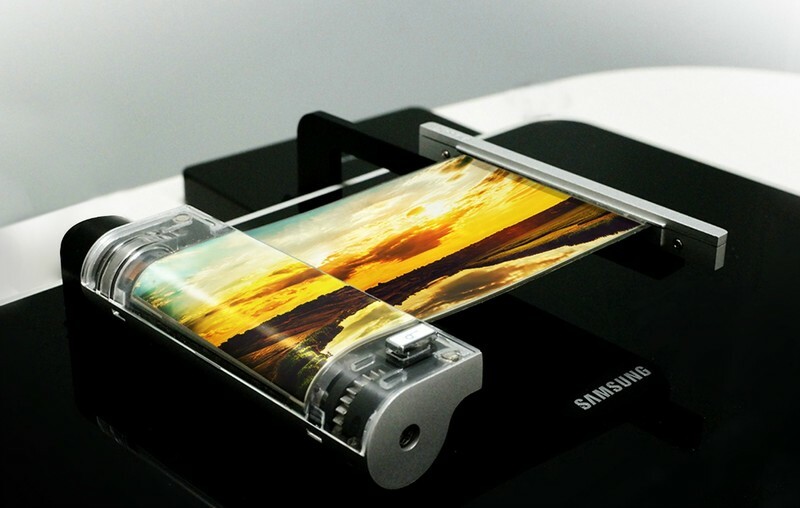 It seems now that Samsung’s going to attempt a full-on single bendable display. 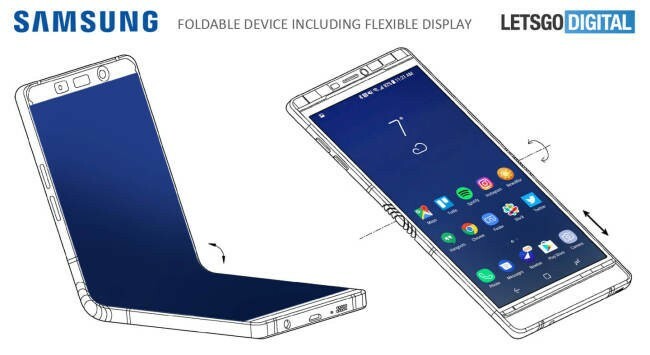 Other rumors also had indicated Samsung had a more tablet-shaped device with this bendable display technology in place, and that may still be on the table in different future devices, but in terms of the “Galaxy X” it looks to be a traditional vertical phone orientation. During IFA 2018 over in Berlin, Samsung’s mobile division CEO — DJ Koh — confirmed that a foldable smartphone will be launched before the year is over. Koh teased that we may learn more information during the Samsung Developer Conference in November, but it’s still unclear when this year the phone will actually go up for purchase. Update August 2018: Updated with a new statement from Samsung about the Galaxy X’s launch. Less than a week ago, Xiaomi shared an official render for its upcoming Mi Mix 3 smartphone — confirming a nearly bezel-less design and a mechanical slider that houses the phone’s camera sensors. Now, Xiaomi’s Director of Product Management, Donovan Sung, has confirmed another feature for the phone — 5G. Sung shared the above Tweet on September 3, and as you can see in the upper right-hand corner of the Mi Mix 3’s screen, there’s a very prominent 5G icon. Along with the 5G confirmation, this photo also gives us another look at the Mi Mix 3’s design, this time with its slider portion closed. While the Spider-Man archive in my brain runs back as far as I can remember, my first Spider-Man videogame was Spider-Man 2. For most people, this game was a deeply positive experience. For me, it was a waking nightmare from which there was no return. I was working in the games department of a Best Buy, where we’d received a full copy of the game to put in our demo station. This lead people to come in as soon as the store opened each day and wait for a turn to play. We had that game in the demo station for almost six months, during which I heard the sounds of web slinging approximately 700 billion times. To say I was not a fan of Spider-Man games at this point would be underselling it considerably. 30 seconds into the first gameplay teaser for Insomniac’s vision of a whole new Spider-Man game, and all of that negativity washed away entirely. 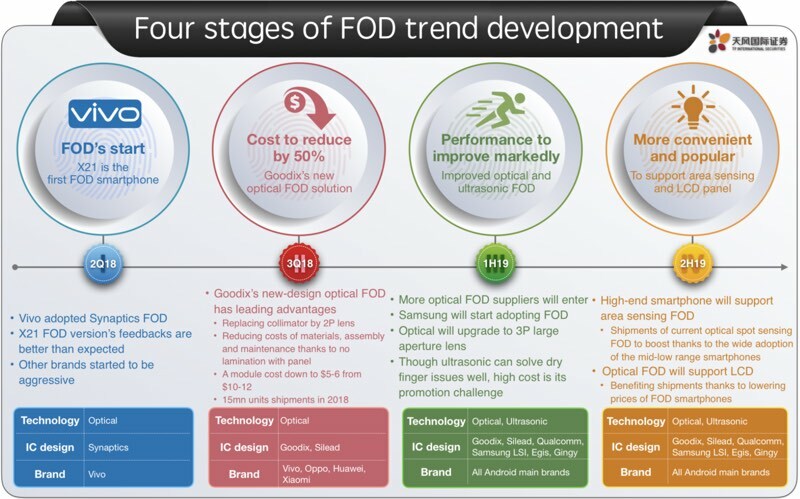 I was excited and, like countless others, started following every step of the development process. 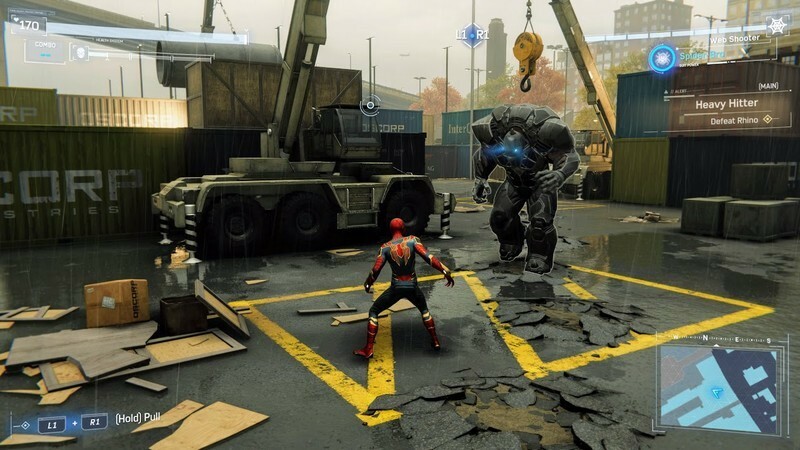 The PlayStation 4 community has been following this game so closely that there was an argument about whether game performance had forced developers to adjust the size of puddles in the game because one was not where it looked like it should be from a pair of gameplay videos. It is not understating anything to say this title has earned itself a rabid fan base before it even launched and, after spending 16 hours in this game, I can safely say a lot of that hype has been well earned. I’ve been playing a copy of Marvel’s Spider Man, provided by Sony, for the last four days. While I have completed the core story, I have only completed 64% of the total game according to the save menu. My total gameplay time for this review is 16.4 hours. But what Insomniac has done here exists on an entirely different level from any other game in this genre. This world doesn’t just kind of look like NYC, it feels like you’re actually there. As someone who regularly travels to a lot of the places in New York where events unfold in this game, it was beyond cool to see things like the Amtrak entrance to Madison Square Garden and appreciate how real it seemed. 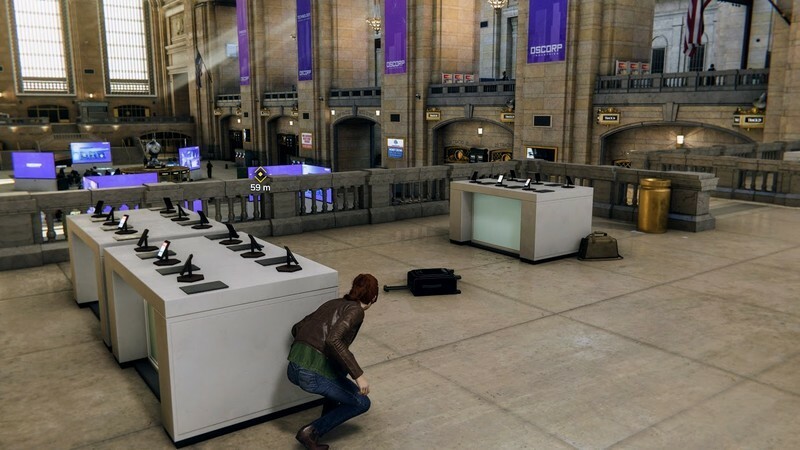 There’s a mission where you are put inside of Grand Central Terminal and you can actually walk up into the Apple Store on the balcony and crouch among the tables full of phones. And for people who have actually stood next to those tables, surreal doesn’t adequately cover it. The basics of a Spider-Man game are polished to a point of realism as well. Most Spider-Man fans are used to having that “what did that web he just shot even attach to” conversation while playing these games. It’s even something you hear about the movies at times. Even in a city like New York, there are limitations to where you can attach a web and swing through and those limitations are pretty reasonably respected in this game. When you sail through the city, your web looks like it connected to something. If you’re up high above the buildings, you can’t shoot a web into nothing and continue swinging. You fall below the buildings and then the web starts flying again. This gameplay mechanic is fairly automatic as you play but there are lots of little things you can do to speed yourself up or perform aerial tricks which make the experience a whole lot more dynamic. You can choose to be less engaged when traveling from place to place, but the game rewards you for having fun and really getting into character. And really, that’s a theme for the whole game. You are rewarded for being excited about the game and for not taking every moment super seriously. Since this web travel mechanic includes a bit of a free-fall, Insomniac doubled-down and includes a way for you to basically skydive straight down from time to time. This is a handy and visually stunning way to bring yourself down closer to the streets and it also helps close the gap when chasing villains in a car. However, all of this sort of falls apart if you hit the ground accidentally. If this happens, Spider-Man assumes the tried and true three-point superhero landing – even if that drop happened from the top of the Empire State Building. There is no death or damage from falling when travelling through the city but you do get to scare the pants off the citizens walking the sidewalks. When you hit the ground everyone around you is immediately alarmed and scatters but this AI quickly forgets why it is running away when someone recognizes you so you get this mix of panic and someone shouting about getting your autograph. This weird mixed panic mechanic even happens when you land on the roof of a police building. The officers standing on the roof for seemingly no reason are not only surprised to see you, but frequently say things like “we don’t need your help right now” as they run from you. Clearly, the civilian AI didn’t get the same level of polish as the rest of the city. As for our hero, well let’s just say he’s not the Spider-Man you’ve seen in the recent Marvel Cinematic Universe films. This isn’t Tony Stark’s ward, as Doctor Strange would call him. This is grown up Peter Parker. He’s graduated from college, has a job, struggles to pay his rent on time and has a great relationship with his aging Aunt May when he remembers to stop by to see her. You aren’t playing through an origin story; this Spider-Man has lived through multiple revisions to his suit and has already defeated many of the big-name villains from the early days of the comics. J. Jonah Jameson has been relieved of his post at the Bugle, and spends his days as a Alex Jones-esque radio loon, which you tune in to as you sail through the city. For many, this is going to be a fairly new take on Spider-Man and I personally loved every minute of it. Perhaps my favorite part of the world Insomniac has created for this game is in the little details. 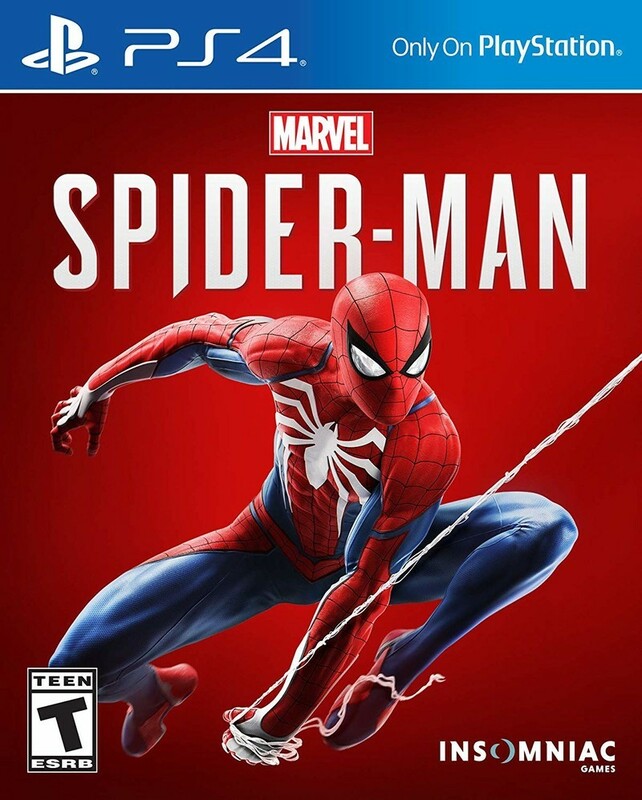 It couldn’t be more clear this game was made by people who cherish the Spider-Man franchise and had some opinions on the direction it had been taken in previously. The game is positively stuffed with references to the other movies and games and comics, from the suits you can unlock to the trinkets you find lying around the city. There are jokes about web gliders, commentary on past relationships and so many nods to other parts of the Marvel universe. And the focus is always on Spider-Man, instead of constantly bumping into the other heroes who also live in the city. You can find Doctor Strange’s New York Sanctum or Jessica Jones’ Alias Investigations, but there’s no awkward side-quest where you have to interact with these heroes and help them with something. This is the most complete Spider-Man experience I’ve ever played and every kind of fan is going to deeply appreciate how much work went in to building this shrine to Spidey. Capturing the way Spider-Man fights in video game form is a challenge no previous developer has quite managed. Spider-Man’s combat style is fluid; he fights in the air and on the ground and around obstacles and with every part of his body constantly. Spider-Man dodges first, attacks when opportunity arises and relies on his webs and web-based gadgets to get him out of trouble when the stakes are truly high. Building all of these elements into a single combat system, without making it too difficult for most people to play and still have fun, seemed almost impossible before playing this game. Insomniac, in my opinion, absolutely nailed what it is to fight as Spider-Man. This combat system is something truly special. You are rewarded for dodging at just the right moment or landing that perfect hit, and you can spend that reward in real time on more devastating and visually stunning takedowns or on quick bursts of health to keep the fight going. You can be surrounded by a dozen enemies and not feel overwhelmed, as long as you keep moving and remember to use your gadgets. Give some of the enemies a reason to pause and free themselves from webs, while you focus on taking down the others. Use the momentum of one enemy to take out another. Never stay on the ground for long, and always remember to dodge first and punch later. It’s challenging but also deeply exciting, and judging from the way my whole family sat and watched as I played this game, it’s almost more entertaining to watch than it is to play. And as much as you are rewarded for thinking like Spider-Man, you’re punished for trying to take on too many enemies with just brute force. This game has no problem killing you in combat and, in most cases, that death is surprisingly violent. 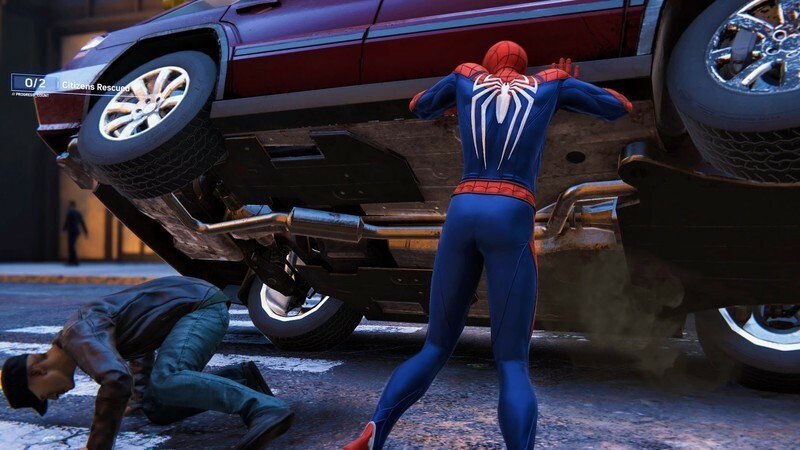 You don’t see blood and guts or anything, but the visuals of Spider-Man’s broken body as a car hits him or as he’s beaten into the dirt quickly refocus you into seeking a different strategy. In missions, death resets you to the last save point but out in the sandbox, you’ll revert to the closest high point on a building or lamp post and whatever random encounter you were in will have disappeared. The bottom line is you really need to be constantly thinking about how you are fighting and moving, which ends up being quite a bit of fun. Marvel’s Spider-Man is a thrilling celebration of everything fans love about the friendly neighborhood web-slinger. Unfortunately, all of that fluid combat and careful thought goes out the window as soon as you are in a boss fight. Every boss fight is scripted, almost entirely taking away your user agency in exchange for something that looks nice. And it’s almost always the same format, too: interrupt the bad guy, land a hit, dodge the counter. Everything else is quick-time events and the occasional grouping of non-boss mobs to help you restore your combat bars for health or extra points for more visual takedowns. It honestly felt like the boss fights were designed by a different team, whose focus was more on exposition than gameplay. As incredible as normal combat feels, that’s how lackluster every boss fight is throughout this game. When you’re not following the story, the sandbox is filled with tons of other things for you to do. You can flex Peter Parker’s mind with research puzzles, stop random crime events throughout the city, follow clues left by Black Cat and a bunch of other clusters of tasks. Each of these events on the map earn you tokens, which you can spend on upgrading your gadgets and purchasing new suits with new abilities. And, mercifully, you aren’t presented with all of these options at the very beginning of the game. Instead, there’s a nice slow trickle so you’re encouraged to spend a fairly even amount of time exploring the city in between plot points throughout the entire game. There are, however, some obvious advantages to fulfilling these side missions as early as possible, especially if your goal is to collect all of the suits. 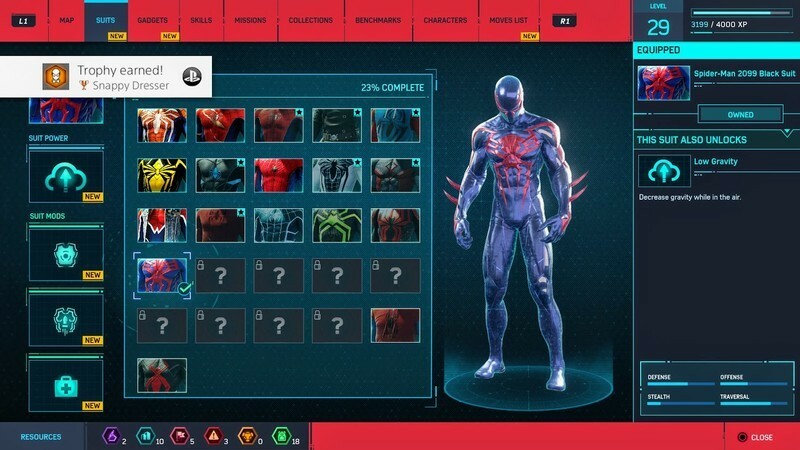 Each of the Spider-Man suits you can unlock has a specific ability attached to it. Some help with stealth, while others give you combat or healing advantages. None of these abilities are actually locked to the suit after you purchase them, which means you can wear the Iron Spider suit from Avenger’s Infinity War but use the super stealth ability from the Spider-Man Noir suit. This means you can wear your favorite suit throughout the whole game without compromising your abilities, which I appreciated. It also means there’s value in unlocking things as quickly as possible so you can see how those abilities impact your combat style throughout the missions. Without giving too much away, you’re really going to want to play with as many of these abilities as possible. The combination of story and side missions comes together to really make this game feel full. By the time you reach the endgame, the map is covered in things to do and the difficulty level for everything from combat to puzzles increases at a steady pace. The whole design encourages you to play through all of the game evenly, instead of just plowing through the story in a rush to the end, which should come together to make at least 20 hours of gameplay by the time you’ve reached the final mission in the story. Insomniac deserves all of the positivity this game is about to receive. It couldn’t be more clear this was a labor of love crafted by folks who genuinely enjoy every facet of the universe they were invited to be a part of. The story is unique yet familiar, the combat natural while complex, and there’s a constant focus on Spider-Man and his immediate connections I deeply appreciated. 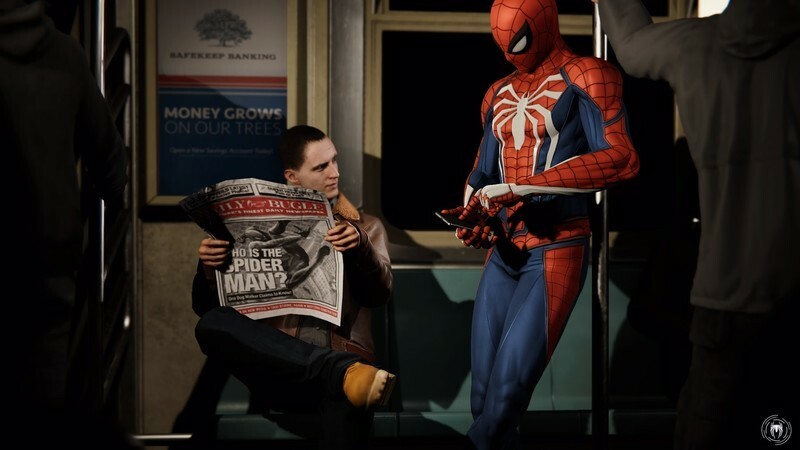 Marvel’s Spider-Man is a thrilling celebration of everything fans love about the friendly neighborhood web-slinger and, with three different DLC packs already announced, it’s clear this is going to be a deeply popular game for quite a while. 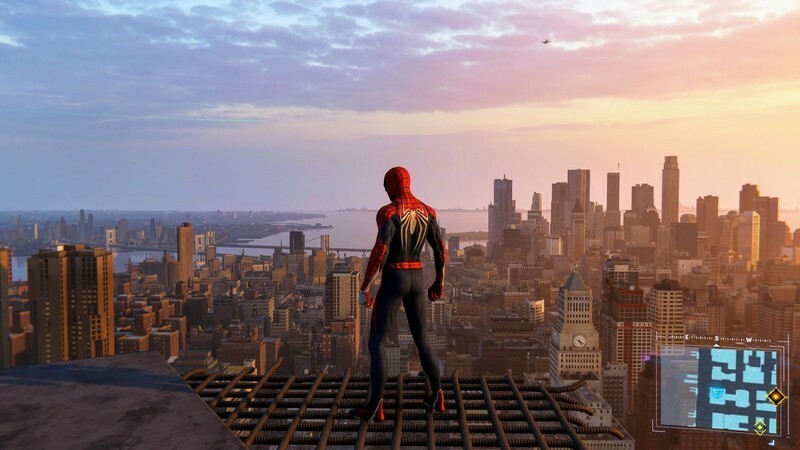 The best thing you can do for the Spider-Man fan in your life is make sure they have time to really explore this game deeply and with as few spoilers as possible. Also, don’t be too alarmed if you catch them shouting with excitement towards the end of the game. It’s fine, I promise. We all did it.